The Travelon Bag Bungee makes your travel easier by simply attaching a second bag to your wheeled luggage so that you can move two items as one. This lightweight bungee attaches to any handle system and can be easily stored in a purse after use. 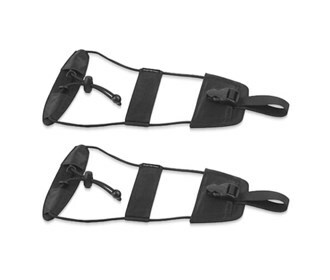 The Set of 2 Bag Bungee - Black has many exciting features for users of all types. You can extend the lifetime of your Set of 2 Bag Bungee - Black with the purchase of a FactoryOutletStore Factory Protection Plan. See the Set of 2 Bag Bungee - Black gallery images above for more product views. FactoryOutletStore stocks a full line of accessories like Boarding Pass Holder, Eye Mask, and Safe ID Classic Passport Case for the Set of 2 Bag Bungee - Black. The Set of 2 Bag Bungee - Black is sold as a Brand New Unopened Item.